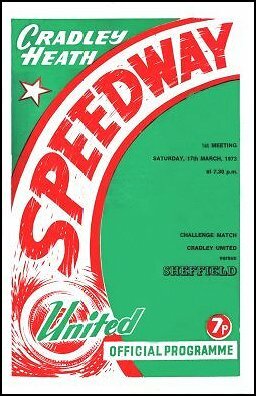 The season started with great expectations, things were looking better with a new name Cradley "UNITED", a new manager, none other than one of Cradley's finest home produced riders - Harry Bastable. No less than four new signings wore the new racejacket. 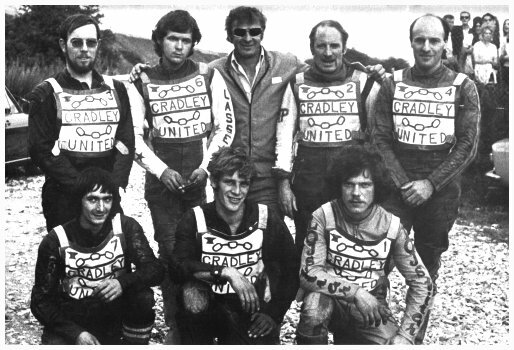 Howard Cole from Kings Lynn, Bruce Cribb from Exeter and veteran Colin Gooddy from Oxford plus an exciting young Swedish rider recommended by Bernie Persson - Lars Hultberg. They started well with a draw away at Swindon,a home win against Halifax and home and away wins against Coventry! Then the injuries came, in May Colin Gooddy broke his collar-bone, then Howard Cole broke his ankle and dislocated his shoulder. Bruce Cribb had a bad smash and broke a leg, then Bernie was out with an injured shoulder and then broke his arm on his return. Malcolm Corradine was signed from Birmingham and Ulf Lovaas brother of Dag from Reading, though they tried hard they were not good enough to make up for all the injuries. Once again the Heathens slipped down the table, winning only seven of the thirty four league matches and ending up with the wooden spoon. One good thing came out of it though, a youngster by the name of Dave Perks continued to improve - never missed a match throughout the year and finished with a respectable 152 points, including paid 12 against Kings Lynn. Also another youngster emerged and went to Ivan Mauger's training school, the stylish Dave Harvey. Two International matches were held at Dudley Wood - Noway/Denmark against Sweden and then five days later against U.S.S.R. The Heathens were put out of the K.O.Cup in Round 1 by Poole but fared a little better in the Midland Cup beating Coventry home and away again but losing heavily to Leicester in the semi-final. Daily Mirror International series, a combined Norway/Denmark team lost 33-45 to Sweden on July 2nd and Norway/Denmark beat USSR 47-31 on July 7th. The Watney Mann Trophy was won by Soren Sjosten in September. The L.P.Trophy was once again a best pairs event back in April and was won by Bernt Persson / Howard Cole. Copyright: Steve Johnson & Cradley Heath Speedway Ltd. 2008.